CEDEX Plastics has begun manufacturing co-extruded polyethylene films for the North American market. The joint venture between U.S. based Exopack and multinational manufacturing group, INDEVCO, culminated from a strategic alliance to source PE-based materials from the Middle East to serve North American markets. In April 2009, the two parties signed their joint venture agreement. Three months later, CEDEX Plastics invested in a three-layer VAREX PE co-extrusion line from Windmoeller & Hoelscher. 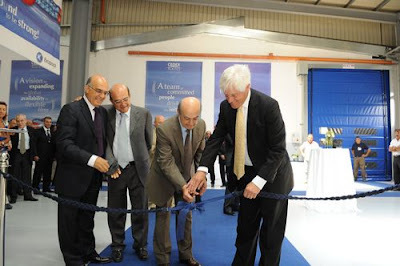 Partner executives attended a ceremony on 8 July to celebrate the production launch at the Zouk Mosbeh, Lebanon plant. The ceremony began with a reception and welcome speeches. serve. It binds two important players of the flexible packaging industry. “to be a global supplier of the best product, at a very low cost, made with the right culture backing it. 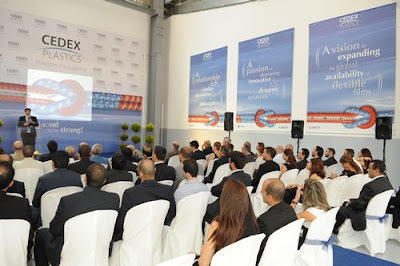 CEDEX General Manager, Wissam Moubarak, engaged the audience with a presentation on CEDEX Plastics, addressing three main points: the initial idea behind CEDEX, progress since signing of the joint venture, and CEDEX’s future objectives and vision. Moubarak discussed the common philosophy and competencies that brought the partners together to achieve their common goals. The presentation highlighted images, from start to launch, of the plant preparation, installation, and production. After the ribbon cutting, visitors took a tour of the CEDEX Plastics production line, followed by cake-cutting and a luncheon buffet. CEDEX Plastics will produce AquaCrystal® Select high-clarity shrink film and CaseFLEX™ Select corrugated case overwrap film, as well as heavy-duty shrink bundling film. The plant will later expand to produce lamination film, surface printable film, and towel and tissue wrap. Founded in 1955 by Georges N. Frem, INDEVCO Group is a privately-owned multinational group comprised of over 55 manufacturing plants, industrial and commercial enterprises. INDEVCO has a global production and distribution platform for its flexible packaging, corrugated packaging, and consumer disposables products and services, including nine manufacturing sites in North America. Awesome, you guys are huge. Very impressive.